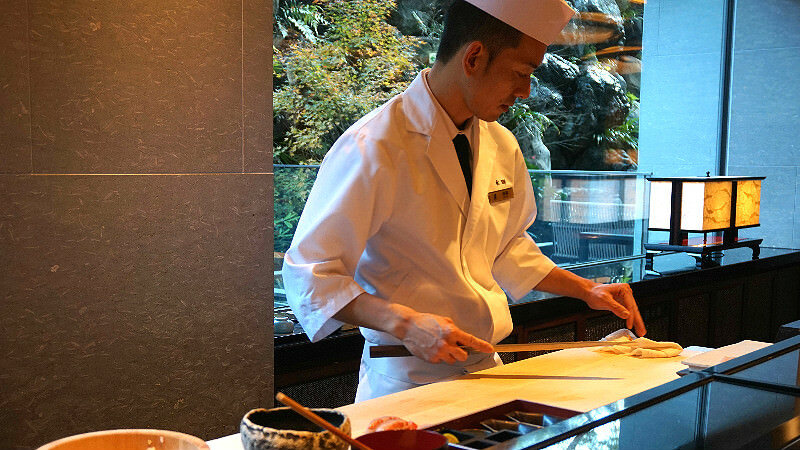 Located right next to the Kamo River, Sushi Mizuki is one of the main restaurants in The Ritz-Carlton, Kyoto. When you enter this restaurant, friendly staff will welcome you with a smile and wonderful hospitability. You can have a counter seat so that you can enjoy watching the sushi chefs create their new sushi that you cannot taste anywhere else. What is great about this restaurant other than the delicious taste of sushi is that all their chefs speak English (one of them even speaks English, Spanish and French!). They can tell you about the history of sushi, traditions, and customs as they serve you. The rice used in Sushi Mizuki is dedicated to Ise-Jingu Shrine, one of the biggest shrines in Japan. All the sushi served in this restaurant is very delicate and sophisticated, so you can enjoy the taste and atmosphere while talking with sushi chef over the counter. This sushi is their signature dish! On top of the carefully chosen rockfish, there is mascarpone cheese. As this mascarpone cheese is blow torched for a second, it has a smoky but fresh flavor. If you come to Sushi Mizuki, we recommend that you try this as you can enjoy the taste and story behind it told by the chefs! This sea urchin was taken in Hokkaido, in northern Japan. The sea urchin is very fresh and sweet, and will melt in your mouth and go well with rice. Even if you don’t like or have never tried sea urchin, you may end up loving this taste and it may make you a big fan of sea urchin! Seaweed cut in the shape of “Shippo” which is the symbol of the seven treasures, an auspicious Buddhist concept. It is served on a plate made by Masao Iwasaki, a famous Japanese potter. Regular mackerel sushi eaten mainly in Kansai area is usually very hard since rice and mackerel are put into the box to make the shape. However, this mackerel sushi is very soft as it is wrapped gently by a cotton cloth. Inside of this mackerel sushi, there is red caviar and Japanese basil which makes this sushi even richer and fresher. What is wonderful about this sushi other than its delicious flavor is that it is cut into small pieces for women. By the consideration of the chef, it is cut so that women don’t need to open their mouths wide. It is interesting to note that soy sauce is applied already before it is served. Shrimp is soft and goes perfectly well with the vinegared rice. If you visit during lunch time, you can choose from two course menus (Wakakusa for ￥6,000 or Yamabuki for ￥9,000). All the sushi chefs are very skilled and speak English, so please feel free to ask any questions regarding the history of sushi ingredients and so on. If you don’t know specifically what kinds of sushi you want to eat, please just ask the chef about their recommendation. They will surely give you a good suggestion! If you would like to enjoy high class, but not too formal sushi, I highly recommend that you visit Sushi Mizuki! Each sushi is very beautiful and also tasty. The taste of sushi and the conversation with sushi chef over the counter will make you smile. Inspired by their passion for sushi and also for treating their guests well, they keep creating new, exciting menu items. 3-minute walk from Subway Tozai Line Kyoto Shiyakusho-mae Station. Please note that it is better to reserve before you visit this restaurant. If you would like to have an experience of making sushi by yourself, you can book the lesson which is held once a month. Please note that it is ONLY for those who stay in The Ritz-Carlton, Kyoto. For more information, please ask the front desk. As all the chefs and most of the staff speak English, please do not hesitate to ask any questions or make requests!